Statue of William Tell and his Son in Altdorf, Switzerland (Richard Kissling, 1895). 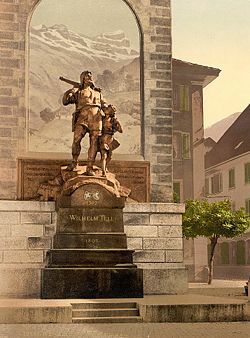 William Tell was a legendary hero of disputed historical authenticity who is said to have lived in the Canton of Uri in Switzerland in the early fourteenth century. The myth symbolizes the struggle for political and individual freedom. The legend began seven hundred years ago when the Austrians controlled what is now Switzerland. The Austrian ruler, Landburgher Gessler, tyrannically demanded every passerby of the marketplace salute his hat, that hung on a pole. Tell, walking into the marketplace for the first time following the edict, refused to salute and was immediately arrested. Gessler, who knew of Tell's skill as a bowman, ordered that Tell's only hope of avoiding execution was to shoot an arrow into an apple placed on his son's head from a distance of 20 paces (approximately 60 feet). According to the legend, Tell successfully split the apple on his son's head and later killed Gessler and thus initiated the movement which secured Switzerland's independence. However, like most folklore, the story as well as Tell's own existence is open to dispute. William Tell from Bürglen was known as an expert marksman with the crossbow. At the time, the Habsburg emperors were seeking to dominate Uri. Hermann Gessler, the newly appointed Austrian Vogt of Altdorf raised a pole in the village's central square with his hat on top and demanded that all the local townsfolk bow before it. As Tell passed by without bowing, he was arrested. He received the punishment of being forced to shoot an apple off the head of his son, Walter, or else both would be executed. Tell had been promised freedom if he shot the apple. On November 18, 1307, Tell split the fruit with a single bolt from his crossbow, without mishap. When Gessler queried him about the purpose of the second bolt in his quiver, Tell answered that if he had ended up killing his son in that trial, he would have turned the crossbow on Gessler himself. Gessler became enraged at that comment, and had Tell bound and brought to his ship to be taken to his castle at Küssnacht. In a storm on Lake Lucerne, Tell managed to escape. On land, he went to Küssnacht, and when Gessler arrived, Tell shot him with the crossbow. This defiance of the Austrian, Gessler, sparked a rebellion, leading to the formation of the Swiss Confederation. The legend of William Tell appears first in the fifteenth century, in two different versions. One version, found in a popular ballad (Tellenlied) from around 1470, in the chronicles of Melchior Russ from Bern (written 1482 to 1488) and in the first theater adaptation of the story, the Tellenspiel from 1512, portrays Tell as the main actor of the independence struggles of the founding cantons of the Old Swiss Confederacy; the other, found in the Weisse Buch von Sarnen of 1470, sees Tell as a minor character in a conspiracy against the Habsburgs led by others. Aegidius Tschudi, a Catholic conservative historian, merged these two earlier accounts in 1570 into the story summarized above. All these early written accounts focus on Tell's confrontation with Gessler. The different versions are not always consistent. The ballad mentions that Gessler had wanted to have Tell drowned in the lake, and Russ mentions that Tell shot Gessler immediately after having escaped instead of at Küssnacht. Similar variability exists concerning Tell's later life, of which the classic tale does not tell. Tschudi's version of the legend has it that he died in 1354 while trying to save a child from drowning in the Schächenbach, an alpine river in Uri. There is a fresco from 1582 in a chapel in Bürglen showing this scene. The story of a great hero successfully shooting a small object from his child's head and then killing the tyrant who forced him to do it, however, is an archetype present in several Germanic myths. The motif also appears in other stories from Norse mythology, in particular the story of Egil in the Thidreks saga, as well as in the stories of William of Cloudsley from England, Palnetoke from Denmark, and a story from Holstein. 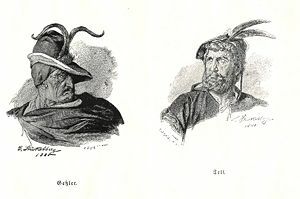 There is also an entry in the Malleus Maleficarum regarding witch-archers that bears a surprising resemblance to the story of William Tell, telling of a wizard shooting a penny off the cap of his young son, including mention of a prince tempting the marksman to attempt the feat, and the second arrow intended for the prince in the event of failure. Characters from the legend are featured in decks of playing cards popular in central Europe. The 48-card German deck was developed in the fifteenth century with various face-card designs, but the William Tell design became extremely popular after the Revolutions of 1848. This view remained very unpopular, however. Friedrich von Schiller used Tschudi's version as the basis for his play Wilhelm Tell in 1804, interpreting Tell as a glorified patriot assassin. This interpretation became very popular especially in Switzerland, where the Tell figure was instrumentalized in the early nineteenth century as a "national hero" and identification figure in the new Helvetic Republic and also later on in the beginnings of the Schweizerische Eidgenossenschaft, the modern democratic federal state that developed then. When the historian Joseph Eutych Kopp in the 1830s dared to question the reality of the legend, an effigy of him was burnt on the Rütli, the meadow above Lake Lucerne where—according to the legend—the oath was sworn that concluded the original alliance between the founding cantons of the Swiss confederacy. Historians continued to argue over the saga until well into the twentieth century. Wilhelm Öchsli published in 1891 a scientific account of the founding of the confederacy (commissioned by the government for the celebration of the first National holiday of Switzerland on August 1, 1891), and clearly dismissed the story as a saga. Yet 50 years later, in 1941, a time where Tell again had become national identification figure, the historian Karl Meyer tried to connect the events of the saga with known places and events. Modern historians generally consider the saga just that, as neither Tell's nor Gessler's existence can be proven. The legend also tells of the Burgenbruch, a coordinated uprising including the slighting of many forts; however, archeological evidence shows that many of these forts were abandoned and destroyed already long before 1307/08. A possible historical nucleus of the legend was suggested by Schärer (1986). He identified one Wilhelm Gorkeit of Tellikon (modern Dällikon in the Canton of Zurich). "Gorkeit" is explained as a version of the surname Armbruster (crossbow maker). Historians were not convinced by Schärer's hypothesis, but it is still referred to by the nationalistic right sometimes, denouncing its rejection by academia as an "internationalist" conspiracy. Antoine-Marin Lemierre in 1766 wrote a play inspired by Tell. The success of this work established the association of Tell as a fighter against tyranny with the history of the French revolution. 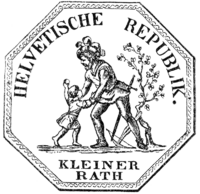 Official seal of the Helvetic Republic. The French revolutionary fascination with Tell found its reflection back in Switzerland with the establishment of the Helvetic Republic. Tell became, as it were, the mascot of the short-lived republic, his figure being featured in its official seal. Johann Wolfgang von Goethe learned of the Tell saga during his travels through Switzerland between 1775 and 1795. He got hold of a copy of Tschudi's chronicles, and considered writing a play about Tell. Ultimately, he gave the idea to his friend Friedrich von Schiller, who in 1803-04 wrote the play Wilhelm Tell, which had its debut performance on March 17, 1804, in Weimar. Schiller's Tell is heavily inspired by the political events in the late eighteenth century, the French revolution in particular. Schiller's play was performed at Interlaken (the Tellspiele) in the summers of 1912 to 1914, 1931 to 1939 and every year since 1947. In 2004 it was first performed in Altdorf itself. Gioacchino Rossini in turn used Schiller's play as the basis for his 1829 opera William Tell; the William Tell Overture is one of his best-known pieces of music, and has become widely reused in popular culture. John Wilkes Booth, the assassin of Abraham Lincoln was inspired by Tell. Lamenting the negative reaction to his deed, Booth wrote in his journal on April 21, 1865, "[W]ith every man's hand against me, I am here in despair. And why; For doing what Brutus was honored for and what made Tell a Hero. And yet I for striking down a greater tyrant than they ever knew am looked upon as a common cutthroat." Following a national competition, won by the submission of Richard Kissling (1848-1919), Altdorf in 1895 erected the monument to its hero. Kissling casts Tell as a peasant and man of the mountains, with strong features and muscular limbs. His powerful hand rests lovingly on the shoulder of little Walter. The scene does not depict the apple. The depiction is in marked contrast with that used by the Helvetic Republic, where Tell is shown like a landsknecht rather than a peasant, with a sword at his belt and a feathered hat, bending down to pick up his son who is still holding the apple. The new design of the Federal 5 francs coin issued from 1922 features the bust of a generic "mountain shepherd" designed by Paul Burkard, but due to a similarity of the bust with Kissling's statue, in spite of the missing beard, it was immediately widely identified as Tell by the population. ↑ Malleus Maleficarum, part II, question I, chapter XVI Retrieved January 16, 2008. Fujita, Tamao. William Tell. Warne, 1976. This page was last modified on 21 October 2016, at 22:18.